Posted June 6, 2017, 12:13 p.m.
Posted Dec. 14, 2016, 12:12 p.m.
Posted July 28, 2015, 12:16 p.m.
Posted July 25, 2015, 7:18 a.m.
Posted July 24, 2015, 3:30 a.m.
Posted July 7, 2015, 6:41 p.m. The last time Bernard Melvin heard from his daughter Carrie, she was calling him to wish him a happy birthday. It was the summer of 2015, and she was living in Hollywood and starting her own social media business. She told him she was the happiest she had ever been and loved her life. Weeks later, her father received unimaginable news. Carrie Melvin had been killed by a man who fired a shotgun blast at her face as she walked with her boyfriend to a Thai restaurant in Hollywood. 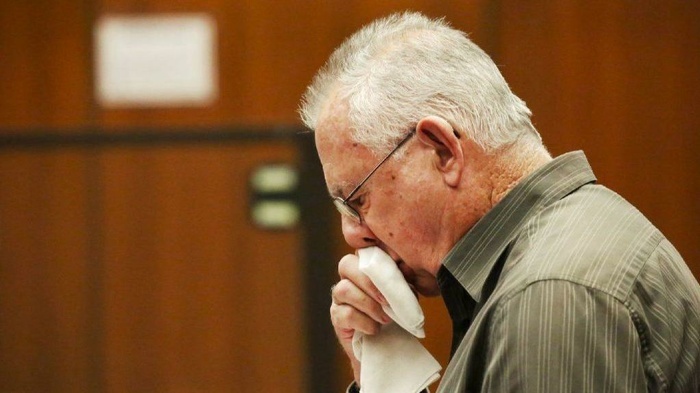 On Monday, Bernard Melvin stood in a downtown Los Angeles courtroom moments before the man convicted of his daughter’s murder was sentenced to life in prison without the possibility of parole. Telling his wife and relatives that his 30-year-old daughter was dead was the “hardest thing” he has ever done, Melvin told the court. “I feel as though I have lost a limb,” he said, his voice cracking. Since then, he said, he has held his wife as she cries herself to sleep, and shed tears with Carrie’s boyfriend. “I have tried to answer my family’s questions, but how do you explain a completely senseless act? We cry every day,” Melvin said. The victim’s older brother, Ryan, said Ezeoma Chigozie Obioha’s insistence that he is innocent compounded the family’s grief. He said he experiences recurring nightmares about his sister’s murder. “Every day it hurts when I wake up and realize she is gone,” he said. Obioha, who was convicted last year of first-degree murder, sat showing no emotion. At one point during the hearing, Obioha’s sister, Nkechi Howell, stood up and yelled, “Judge, you're sending an innocent man to prison." She rushed out of the courtroom, followed by court bailiffs. After the hearing, Superior Court Judge Robert J. Perry scolded Howell, calling her behavior “inappropriate." The morning after the killing, a boy playing on the beach in Malibu found Obioha’s Mossberg 12-gauge shotgun under a rock. Lying nearby was an unusual shotgun shell, identical to an expended shell found at the crime scene: a white Rio Royal Grand 12-gauge, 00 buck shell with the head stamp “globalshot.com,” prosecutors said. Jurors deliberated about a day before convicting Obioha and finding true the special-circumstance allegation that he committed murder for financial gain. Defense attorneys plan to file an appeal. Obioha’s defense attorneys had argued that the shotgun shells, as well as the gun, were planted. A blast from a Rio Royal shell would have caused more wounds to the victim’s face, they argued. And they attacked a six-man photographic lineup that two witnesses — Carrie Melvin’s boyfriend and a security guard who saw the attack — used to identify Obioha as the gunman. After the guard described the shooter as “abnormally dark,” he pointed out two possible suspects from the lineup. One was Obioha, whose photo was the darkest in the lineup. “That is manipulated,” attorney Dana Cole told jurors during the trial, referring to the photo. “That is totally manipulated, and it’s just not right." Obioha’s mother also told jurors that her son was at home the night of the slaying. Deputy Dist. Atty. Michelle Hanisee suggested that Obioha’s family had lied and fabricated evidence to protect him. Defense attorneys downplayed the idea of a financial motive for Obioha by showing jurors a receipt indicating that he paid Melvin $1,740 in cash on the same day he wrote a $1,620 check that didn’t clear. Obioha’s sister found it after her brother’s arrest, and the May 2, 2015, entry in Obioha’s receipt book was out of chronological order. The obvious conclusion, Hanisee said, was that the receipt was fabricated. “Every scrap of evidence that points to anyone points to him,” Hanisee told the jury. And the prosecutor noted that it wasn’t until November 2016 that Pauline Obioha said for the first time that her son was with her on the night of the killing. “I think at some point, her mom instincts overtook her,” Hanisee told jurors. In phone calls from jail, she added, Obioha gave his family different explanations about what happened to his gun. First, he said that it had been stolen. Then, that Melvin’s boyfriend had taken it to set him up. Lastly, he said it had been planted by an ocean photographer who wanted his Instagram and Facebook accounts featured on the news, the prosecutor said. In court, the victim’s father said that after sitting through the trial and hearing the evidence, he’s convinced that Obioha was the person who killed his daughter. He urged Obioha to accept the sentence. “I had to hear and see things in the trial that no parent should have to see,” he said.